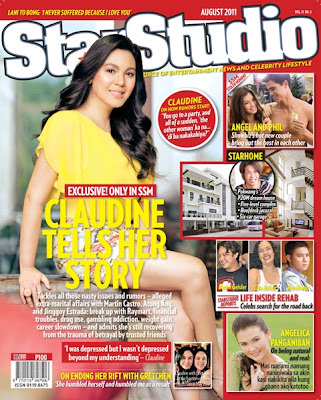 StarStudio Magazine features former Kapamilya star Claudine Barretto on the cover of its August 2011 issue. Claudine Barretto tackles all the issues and rumors about on her alleged extra-marital affairs with Martin Castro, Atong Ang and Jinggoy Estrada; break-up with husband Raymart Santiago; financial troubles, drug use, gambling addiction, weight gain, and career slowdown and admits she’s still recovering from the betrayal by trusted friends. In this issue, she also talks about her reconcilation with sister Gretchen. The August 2011 issue also features the new, P20-million, five-level dream house of Pokwang. The home, which has a roofdeck jacuzzi and six-car garage, is a testament to the Happy Yippee Yehey host’s hard-work and a reward for all the hardships she’s been through.